Perfectly positioned in Parkdale. Only 100 meters to beach & 600 meters to train and Parkdale village. Tranquil and secure, totally private with enclosed garden and 2 car lock up garage. The best private & public schools! LONG or SHORT TERM guests welcomed. Step into the spacious lounge with 50inch TV and very comfortable leather seating. This adjoins a formal dining room for 6, and fully equipped kitchen with breakfast bar. The family room has a table, chairs & couch. Master bedroom has a new king bed, large desk, flat screen TV and built in robes. Second bedroom has 2 single beds or a King bed if required, built in storage and robes. Sunroom with a daybed that can be made up as an extra single. Great storage with linen and broom cupboards. Bathroom has shower & vanity. Guests bathroom toilet & vanity. Full equipped laundry with spa and baby bath. Private walled & gated garden with an extensive paved courtyard. Outdoor entertainment area, table, chairs and BBQ. There is a massive 2 car secure garage and off street parking for 5 cars. Guests have exclusive use of whole property 105 meter square house, with additional patio, garden, outdoor BBQ and entertainment area, garage and private entrance. Well behaved and fully trained pets are welcome by prior arrangement. We have local restaurants galore with a choice of Mexican, Thai, Pizza, Indian, Fish n Chips, Chicken, Burger & Coffee shops. Also gift shops, florist, butcher, delicatessen, hairdresser, beauty therapy, IGA supermarket & liquor store. Our neibourhood is quiet and friendly. Parkdale has a beautiful and safe swimming beach. Enjoy a walk or ride along the Bay Trail to Mordialloc Pier, famous Ricketts point Beaumaris is 3.6km, or St Kilda Beach 21km. Local supermarkets Safeway, Coles, Aldi, IGA all within 5 minutes drive. Bus stop is 180 meters walk to Beach Road with the 903 Smart bus running via Mentone & Mordialloc to the huge "Chadstone Shopping Centre" & Altona. Parkdale Station is an easy 550 meter walk with regular trains running to Melbourne CBD This is a 46 minute trip by train or by car approximately 40 minutes. Tullamarine Airport is 1 hour 39 minutes by train & Sky bus or 58 minutes by car. Explore Mornington Peninsula, less than an hours drive and visit art galleries, wineries, restaurants, bay & surf beaches, hot springs. We look forward to meeting you to show you around & are only a phone call away if needed. We are a retired couple and have enjoyed living in the area for many years. The photo of our family was taken in 1980 at a Melbourne Victorian themed exhibition and we had fun being serious and posing in period costumes! Our children & grandchildren at still living in the area. We still get to dress up at family gatherings and parties, the latest one being a Jungle themed birthday. 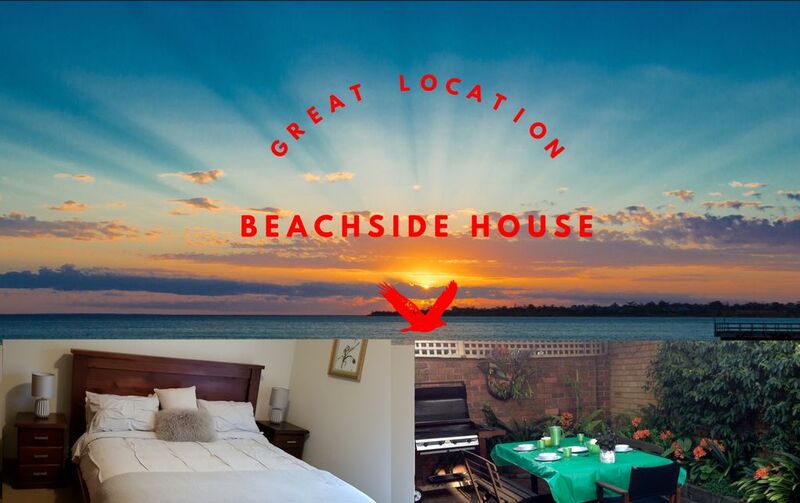 We are both very active and enjoy restaurants, travel and outings with friends and family. The property was built by family members back in 1978 and we have been managing for the past 4 years as a long term and short term rental. We are in a fabulous position and know this area is safe, quiet and offers the very best lifestyle to residents. Walk 100m to beach, 600m to train station. Private and secure single level home. Fully fenced garden with BBQ, pergola & outdoor furniture. Secure locked 2 car garage. Bedrooms, Master with King bed, built in robes, desk & TV. Second bedroom with 2 King singles or made up as a King bed! Fully equiped kitchen with oven, cook top, island bench seats. Family room adjoins kitchen and has table and chairs for 4. Spacious Lounge with leather seating 50inch TV Adjoining Dining room with seating for 6. Bathroom with shower & vanity, Powder room with toilet & vanity. Laundry with washer, dryer and large spa bath. Sunroom with daybed. Instructions in the Blue house manual. We appreciate you turning off when not at home. Instructions in Blue house manual. Please do not leave on when not at home. Parking for up to 5 car down the private drive. Spacious 2 car garage with secure electric roller door. beach towels are in the hall cupboard. Full size with freezer attached. Beautiful antique table & 6 chairs. There is a formal bone china set for 6 in sideboard. Childs highchair available upon request. Are in cupboard in Kitchen & second bedroom. This is in the laundry. Very clean, bright, spacious home with well equipped kitchen for cooking full meals. Many beautiful areas to hang out and relax - picnic table outside, sunroom, deep spa bath, large lounge, sunny family room, TV with DVD in master bedroom, private driveway with ample parking for visitors. Owners very supportive and lots of information was left - even labelled light switches. Beach cafe a few houses away, with lights to cross Beach Rd, and lovely walking track along the beach. In the other direction, a five min walk to the Parkdale shopping strip with cafes, take away, art gallery/theatrette, train station. A very peaceful stay in beautiful surrounds. Thank you so much for the fantastic review and for being the perfect guest! We hope you will recommend our property to your friends & family. Great place and great owners who were waiting for us on arrival and took a tour of the place and gave us all necessary information. Hi Harsha, Thank you so much for the review! We do appreciate as our property and we think it is pretty special. It was a pleasure to meet you and your family & thank you for being 5 star guests. We have found a section train track which your twins will miss next time the train comes out! If you would like it posted please send your address.